Did you know that four out of every five Americans live in urban centers? Chances are, if you aren’t living in an urban environment yourself, you no doubt have loved ones who are. In the wake of a disaster, debris and glass from destroyed buildings can create dangerous terrain and obstacles. There will be increased opportunities to scavenge for water and food from abandoned buildings. There will be a heightened chance of encountering other humans–a factor that can be either good or bad, depending on the situation. Buildings and available debris may provide for shelter, lessening the need to have emergency shelter supplies on hand. To effectively pack your urban bug-out-bag, or that of a loved one, we’ve compiled the top five urban survival considerations and provided details on how you can best prepare for them. When evacuating densely populated areas, first movers have a clear advantage. If you delay your exit until everyone else is trying to leave as well, you’ll find most manner of transport–such as highways and train routes–hopelessly clogged. The best thing you can do to ensure you are ready to move as soon as possible is to have your bug-out-bag packed and easily accessible; while everyone else is making a mad-dash for supplies at the last minute, you’ll be all set to go. If your bug out plan involves multiple people from different areas, make sure you are all fully aware of the bug out plan and have an agreed upon meeting place; it’s also prudent to set up a contingency meeting place should something go wrong. If you’re ever in doubt, just MOVE! In an urban disaster scenario, those who keep moving will be most likely to survive. No doubt everyone around you will be confused and unsure of what to do–don’t wait for them to all agree on a plan, get yourself and your bug out crew moving as quickly as possible. The elements that make the modern urban landscape so beautiful in times of peace can be the same ones that threaten your survival during a disaster. One of the biggest concerns when packing for an urban bug-out is the amount of dangerous debris from damaged buildings that can poison the air, such as asbestos, concrete dust, broken glass, and toxic smoke. Work gloves – particularly useful if you need to break glass or move debris, a sturdy pair of work gloves will protect your hands and allow you to work much longer. Dust mask – found in any local hardware store, a dust mask is essential for providing protection to your lungs from any airborne debris particles. Crow bar / pry bar – essential for scavenging, removing barriers and debris, and hammering out glass. Two great choices are the Ka Bar – Becker and the Stanley Fubar. Additional gear such as eye and hearing protection. 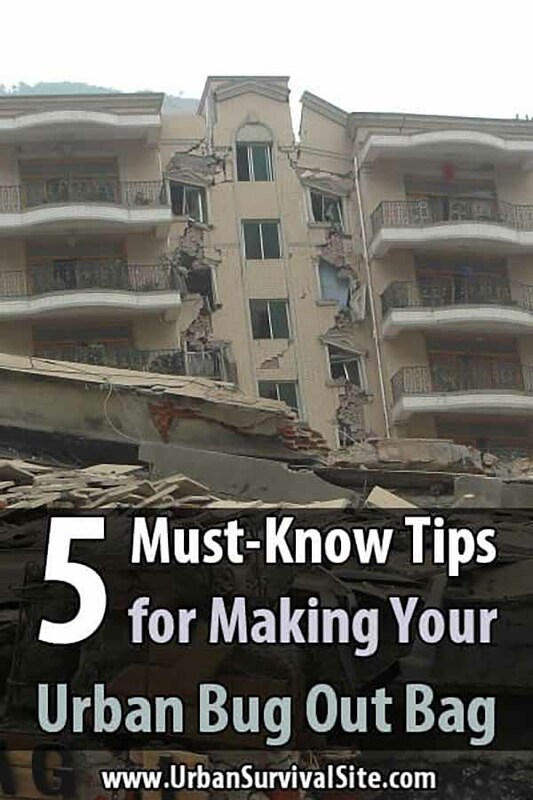 Damaged buildings can also create serious obstacles you may need to maneuver around, so your bug-out gear should include sturdy shoes, well-made pants (even in summer as you will want protection from jagged or burning debris), and a long-sleeved shirt. Desperate times call for desperate measures and during a disaster, no one will be more desperate than the unprepared. The concept of becoming a ‘grey man or woman’ is to blend into the crowd and not draw attention to the fact that you are well-stocked with survival gear. Ensure the clothes you pack are ‘normal’ looking and not tactical-looking gear such as camo. Remove any military style logos from your gear. Never open your bug-out-bag in a crowded area where others may catch a glimpse of what’s inside. Avoid unnecessary eye contact with strangers. Conceal any obvious survival gear you are carrying on your person. One of the inherent risks of bugging out in an urban environment is that you are undoubtedly likely to encounter more people than in the wilderness. This can be a godsend if those people are friendly and can help with your survival plan. Travel in a large group if possible; single travelers are far juicier targets than a group of people obviously traveling together. Keep a self-defense item – such as pepper spray, knife, or firearm – ready to deploy; demonstrating that you are armed and prepared to defend yourself diminishes your appearance as an ‘easy’ target. Always be aware of your surroundings; keep an eye out for people that appear to be following you or whether or not you are possibly entering a dangerous area. Remember to engage the ‘grey man or woman’ tips from above and stay off the radar of those who are desperate. In times of disaster, remember that the majority of people will NOT be prepared. They will be making rash decisions in a state of panic and emergency. Don’t let what the crowd is doing influence your disaster plan. Stick to the bug-out plan you prepared and improvise when necessary. Only follow a crowd of people if it fits in your pre-determined bug-out plan, not because you think they know something you don’t. When in doubt, trust your instincts. If it doesn’t feel right, it probably isn’t. Don’t simply choose the path of least resistance, choose the one that will keep you and your family safe. Now that you’re familiar with some of the scenarios you’ll need to prepare for when bugging out in an urban area, you’ll better be able to pack the necessary items to ensure an effective urban survival kit. While the five considerations listed in this article apply to most any urban area, you’ll want to ensure you tailor your kit to your specific urban locale (see some tips on customizing your urban kit here). Consider the unique nuances of your particular area, such as how easy will it be to scavenge food as you go or how likely are you to run into aggressive, dangerous humans. The more specific to your own situation you can make your bag, the better prepared you’ll be. Chris Ruiz is a lifelong outdoorsman and has been interested in survival tactics and practices for many years. He currently helps people prepare for unforeseen disasters at The Bug Out Bag Guide. For more information on disaster preparedness, emergency planning, survival skills, every day carry, or picking bug out gear, please visit: TheBugOutBagGuide.com. With all the stuff I have in my bug-out bag, one thing I have found to be very useful is a roll of bird netting, can be bought at Lowe’s for about $7 or $8 or so. I have used it as a snake trap to catch snakes with. Just string up an 18 inch wide strip on the ground around your campsite and it will snag any snake trying to get into your perimeter. They get caught in it and cannot get out of it. Snakes can be useful as food in an extreme survival situation. Also, the bird netting can be used as a fish net to trap or catch fish with. In addition, it can be used in a snare to catch small animals for food as well. I live in a swampy area and have bird netting stretched around the bottom of my cabin and have caught many water moccasins and other snakes trying to get under my cabin. Bird netting is easy to pack, and weighs absolutely nothing. Thanks for the tip, I never thought of that. Exellent tips. It is important for us to be aware when emergency comes ar any disaster. I have always had a BOB – living on the gulf coast with yearly hurricanes. since im retired and don’t have a car in the city, I have decided to get a larger rolling suitcase to go with my backpack. just wanted to let you know how much I appreciate all the great info I get here at your site. thanks.